When printing is finished, the press room converts into a bindery. A custom made table top is fit over the press bed providing more table space. It is difficult to make the conversion smoothly, since a press room and a bindery are very different environments, but one adapts. 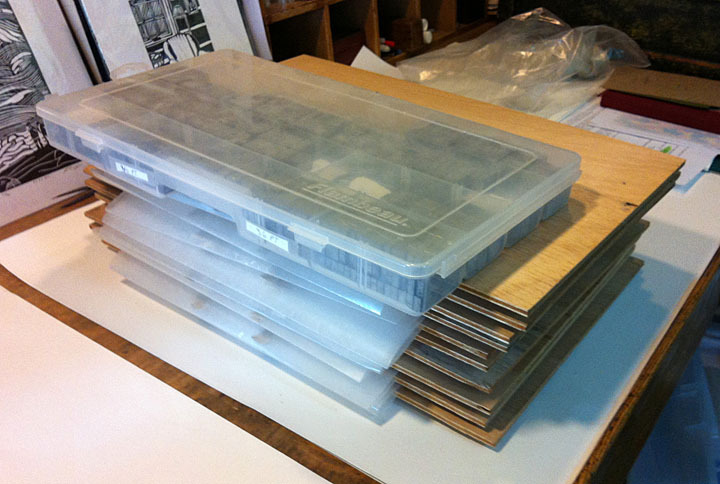 I use almost nothing that would be considered professional bookbinding equipment. Even the needles I use for sewing aren’t “official” bookbinding needles. I do use a bone folder which is a traditional bookbinder’s tool, and I own a nipping press… very handy for nipping the cases after cloth and/or paper has been glued down on them. But most everything else is purloined or conscripted from other purposes. The boards I’m using to press the glued endpages are thin plywood, leftover from a rough shelving unit; they are a far cry from the lovely hardwood boards that professional binderies stock. The weight I’m using is a container of lead spacing material for type. I suppose my point is that everything in the studio must be prepared to serve in two (or more!) capacities, and this works pretty well for the most part. Sometimes I find it a problem when, after many months or even years between a certain conversion, I forget exactly what esoteric object I used to achieve a certain goal or effect. One begins to feel like McGyver. What I miss most from a professional bindery are high tables that bring the work to just about chest height. 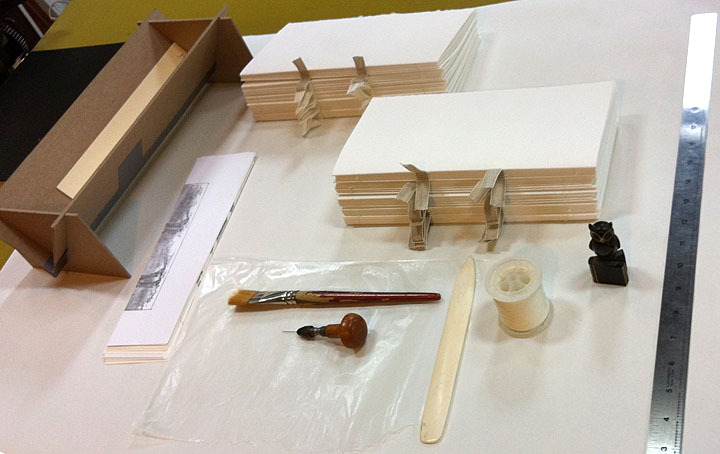 In production binding, after many hours stooped over a regular height table, you begin to feel it. Sometimes I’ll drop a computer chair down to it’s lowest, but usually I set an old wooden tool chest up on the workspace, and set the work I’m doing on that, which helps my back and neck immensely! The work show above is another ten copies of Tintern Abbey under way. the next step will be to glue up the spines, attach end bands and line the spines with mull (a kind of thin mesh) and paper. This entry was posted on June 3, 2012 at 3:51 pm and is filed under Bookbinding, Letterpress printing. You can subscribe via RSS 2.0 feed to this post's comments.